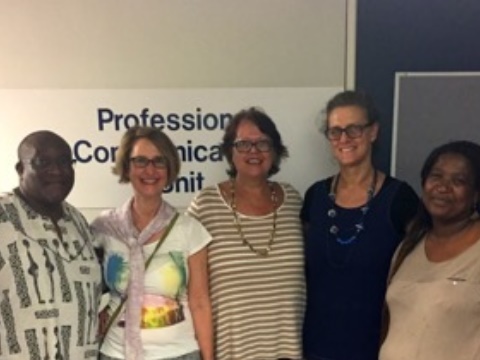 Research and education transcend borders: ISM professor Ute Rademacher has been invited as visiting professor at the School of Management Studies at the University of Cape Town (UCT). The UCT is not only African’s oldest university but also one of over 175 partner universities of the ISM. During her stay, the ISM professor of Business Psychology has provided valuable contributions emerging around topics such as "Leadership, People Management and Team Work“, “Qualitative Research Methods”, “Global Trends in Corporate Communication” and "Diversity Management from a Psychological Perspective”. She was also a member of the jury evaluating business propositions on potential ICT products. Those had been developed by Cape Tonian student teams in a three-week period to propose technical solutions to how Cape Town could become a “Smart City”. “She was the perfect visiting scholar for our School in that she embodied the perfect combination of serious academic and teacher with a warm, friendly, engaging and open disposition“, Professor for Organisational Psychology Suki Goodman stated. From a research point of view, Ute Rademacher gathered quantitative data amongst South African students that will enrich the current research project on the „country-of-origin effects“ of the master student group at the ISM Hamburg. In so doing, students can explore the research topic from international and intercultural research perspective. The UCT is an inclusive and engaged research-intensive African university that inspires creativity through outstanding achievements in learning, discovery and citizenship. The university strives to enhance the lives of its students and staff, advance a more equitable and sustainable social order and to influence the global higher education landscape.